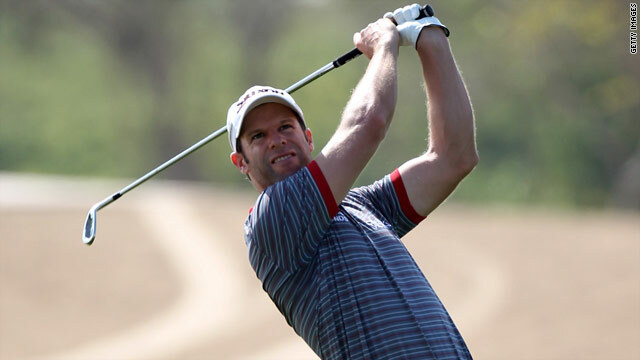 Bradley Dredge holds a share of the Qatar Masters lead after carding an opening five-under-par 67 in Doha. (CNN) -- England's Oliver Wilson and Bradley Dredge of Wales charged into the first round in the Qatar Masters with brilliant five-under-par rounds of 67 on Thursday. Both players defied windy conditions on the Doha Golf Course to take the lead from a high-profile chasing group one stroke behind. Wilson carded six birdies against a sole bogey, with Dredge making his effort late with five birdies in his last seven holes. Ryder Cup star Wilson is still seeking his first win after a string of near-misses and has been examining his technique in great detail. "I looked at my golf from every angle and discovered that I was not balanced in my swing," Wilson told reporters. "It was filmed with high-speed cameras and adjustments have been made. I am happy with the way I am hitting the ball, my distance and flight has changed. I hit some really good long irons into the wind, which has been a weakness in the past, and I am really looking forward to the months ahead. "I hit some really good long irons into the wind, which has been a weakness in the past, and I am really looking forward to the months ahead." Inaugural Race to Dubai winner Lee Westwood, his predecessor as European number one Robert Karlsson of Sweden, Germany's Marcel Siem and another Swede, Alexander Noren all carded 68s. It was a welcome return to form for Karlsson, who saw his 2009 campaign heavily-disrupted by an eye problem. The highlight came at the 15th hole where he carded an eagle after holding an eight-iron approach. Other morning starters were not so fortunate, with European Ryder Cup captain Colin Montgomerie shooting a 76 and former British Open champion Todd Hamilton carding a 78. Spain's Sergio Garcia stayed in contention with a two-under 70, one better than compatriot and defending champion Alvaro Quiros. Westwood, playing with a new set of irons this week after missing the cut in Abu Dhabi, played much more solidly and carded four birdies, including two in his final three holes.